We’d love your help. 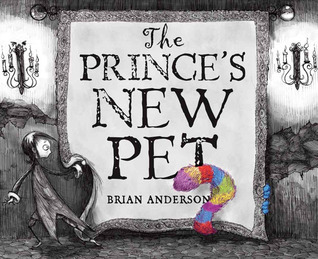 Let us know what’s wrong with this preview of The Prince's New Pet by Brian Anderson. The Prince's birthday was just like every other day in his father's kingdom-drab, gloomy, and completely colorless. Years ago the Prince's father had banned all color from the kingdom, so the Prince now received the same gray gifts wrapped in the same gray paper and ate the same gray birthday cake, while outside gray skies loomed. But when a special package arrives at his party, the Prince is surprised to see a very unusual creature emerge. Will his new pet bring a splash of color to the kingdom? To ask other readers questions about The Prince's New Pet, please sign up. Brain Anderson has created a beautiful book. His lush grey backgrounds, enlivened by detailed scratchy black line drawings, attract children and adults. There is a Goth charm to his illustrations reminiscent of Edward Gory and Tim Burton. The addition of Anderson’s comics sensibility, he is the author of the Dog eat Doug strip, ensures kids, and not just adults, are entertained by the art. The all grey environment of Prince Viridian’s world is the result of his mother’s death. Queen Perylene, (a Brain Anderson has created a beautiful book. His lush grey backgrounds, enlivened by detailed scratchy black line drawings, attract children and adults. There is a Goth charm to his illustrations reminiscent of Edward Gory and Tim Burton. The addition of Anderson’s comics sensibility, he is the author of the Dog eat Doug strip, ensures kids, and not just adults, are entertained by the art. The all grey environment of Prince Viridian’s world is the result of his mother’s death. Queen Perylene, (a shade of red), had so loved color that on her death the king banned it and hired a sinister color catcher to lock it away. Into the prince’s drab birthday, he has licorice cake with grey frosting, drops a wooglefoof, a neon rainbow of an animal: vivid, vibrant and sublimely cuddly. The evil color catcher, with a creepy Cheshire cat grin, is predictably thwarted in his attempt to lock up the wooglefoof and take over the kingdom. In fact his candle head-lamp is responsible for releasing the explosion of paint and fireworks that restores hue to the countryside. Despite the book’s beauty and many moments of kid appeal, its charm is superficial. The characters remain two-dimensional and the reader may feel confused by sudden, unexplained shifts. How can the prince be in a courtyard and seconds later at the top of a tower? Why is the imprisoned artist, Murialis Mahew, initially so menacing, and isn’t it disconcerting to next see her, a red-haired queen, and Viridian’s new mom, under rainbow skies. This handsome book entertains visually, but sadly lacks the depth or emotional truth that would make it great. I recieved this book a few minutes ago today and the moment I tore open the packaging I fell in love with it. I couldn't resist from turning the pages and finishing the story once I started reading. The beautiful illustrations just drew me in and held me there. It was Viridian's birthday and amidst the dull boring party o I recieved this book a few minutes ago today and the moment I tore open the packaging I fell in love with it. I couldn't resist from turning the pages and finishing the story once I started reading. The beautiful illustrations just drew me in and held me there. I grabbed this book at the library because it was different then most children's books and I was very intrigued. It's about a kingdom where a King, who at the loss of his wife, banishes the thing she loved most and therefore would remind him of her. Color. The Prince received a strange gift on his birthday and it leads him on a grand adventure that leads him down in the dungeon to the royal painter. It's a very interesting book and I myself enjoyed it. It started out so dark and then ends in brig I grabbed this book at the library because it was different then most children's books and I was very intrigued. Drab, dreary, depressing—those are the moods one associates with gray and black colors. The book certainly fulfills that expectation. But the simple line drawings do not bore but convey a range of texture, mood and expression. Mr. Anderson proves that in the skilled hand of a true artist, even grays can be expressive. The story itself is a uncomplicated one. Words take turns with pictures to tell a story of an entry of a magical, many-hued creature called the Wooglefoof that brings joy and pleas Drab, dreary, depressing—those are the moods one associates with gray and black colors. The book certainly fulfills that expectation. But the simple line drawings do not bore but convey a range of texture, mood and expression. Mr. Anderson proves that in the skilled hand of a true artist, even grays can be expressive. The story itself is a uncomplicated one. Words take turns with pictures to tell a story of an entry of a magical, many-hued creature called the Wooglefoof that brings joy and pleasure through its mere presence into the life of one unhappy little prince longing for more than gray licorice-flavored cake for his birthday. The revelation that others cherish color as well means that he has unexpected allies in his wish for a brighter world. The ending meets that wish in a surprising way. A fine book for children and an unexpected treat for this adult. The Prince's New Pet was a delightful surprise. I read the story to my two kids today, ages 5 & 6 and the both loved it. Even I, as an adult, found the art to be visually appealing. I love the effect of the blacks and greys, with just tiny pops of super vivid colors. The art work was also very, very well done. The story captivated the kids attention and they kept trying to rush ahead to see what happened next. They also enjoyed trying to figure out what was going on, on the pages that had no The Prince's New Pet was a delightful surprise. I read the story to my two kids today, ages 5 & 6 and the both loved it. Even I, as an adult, found the art to be visually appealing. I love the effect of the blacks and greys, with just tiny pops of super vivid colors. The art work was also very, very well done. The story captivated the kids attention and they kept trying to rush ahead to see what happened next. They also enjoyed trying to figure out what was going on, on the pages that had no text. They asked me to read it to them again tomorrow, so I think they give it their seal of approval! I. LOVE. THIS. BOOK. The artwork was FANTASTIC and I know LOTS of children would love and do love the artwork style. Every time I see this book I am enraptured. It's such a beautiful contrast between the black and white inky drawings and the wonderful rainbow pet! I just love this book. The story starts off with the son of the king not being very excited about his birthday due to the fact that there is not much excitement in the kingdom because his father had banned color. The reason for this was because the prince's mother loved colors and since her passing the king did not want anymore color in the kingdom. During the birthday party an unexpected gift pops up which happens to be an animal called, "illustrations", but gets caught by the royal color catcher trapping it where al The story starts off with the son of the king not being very excited about his birthday due to the fact that there is not much excitement in the kingdom because his father had banned color. The reason for this was because the prince's mother loved colors and since her passing the king did not want anymore color in the kingdom. During the birthday party an unexpected gift pops up which happens to be an animal called, "illustrations", but gets caught by the royal color catcher trapping it where all the color goes. The prince then is determined to find out where the colorful animal went in which he runs into the royal court painter who was also put into the place where all color is trapped and help the prince and the illustrations leave until the color catcher is motivated to keep both in the dungeon in revenge to get his father's crown and rule the kingdom. After a suspenseful fight between the prince and the color catcher, the color catcher falls into a whole releasing color back into the kingdom which is how it stayed. After the king's wife died, he banned all of the colors of the kingdom for his wife loved beautiful colors so, that he couldn't bear to be reminded of her and carry the burden of his grief. But he did not realize the impact his actions would have on his son. For many years, the prince gazes out at the same scene day in and day out, the drab grays of the sky, watching the same gloomy people, below until one day on his birthday, a strange package arrives with a very unusual creature in it with a fox-like tail, long ears like a rabbit, a face like a puppy, with the colors of a rainbow. Once the creature is discovered the Color Catcher is sent to capture the creature and attempts to dispose of him. The Prince knows that some rules are meant to be broken and changed in order to protect others and he goes after the creature to save it. This book is beautifully drawn and so vibrant when colors are introduced. Sadly though, the story lacks depth. The author doesn’t explain how key events happen in the book. He relies too much on the pictures to tell the story, but he does not have enough to do so!! The story seems like a cross between Tim Burton and Dr. Seuss. While the book requires a lot of suspension of disbelief, I would still encourage others to check it out for the artwork. Unique illustration style was the book’s main appeal for me. Wooglefoof is the greatest name for an animal. I feel like the story could have been executed better, but I loved the premise of this book, and the illustrations were very Burton-esque, which is awesome. I love the artwork. The colors are so much brighter in the grey background. The story is about s husbands grief when his wife died. Since she loved color he had all color banned. This book is not for children. It's super long and the bad guy issues death threats! This is a great story for kids to read to get them to start thinking about moving from picture books to books with heftier plots. It is Prince Veridian's birthday and he is glum. Since his mother died, his father banished all color from the kingdom. From that day on, everything was a shade of gray. The Prince is dreading going to his own birthday party knowing that all of his present and cake will be in grayscale. Upon arrival, his thoughts are confirmed. There is no color to be seen. That's whe This is a great story for kids to read to get them to start thinking about moving from picture books to books with heftier plots. It is Prince Veridian's birthday and he is glum. Since his mother died, his father banished all color from the kingdom. From that day on, everything was a shade of gray. The Prince is dreading going to his own birthday party knowing that all of his present and cake will be in grayscale. Upon arrival, his thoughts are confirmed. There is no color to be seen. That's when a box falls out of the sky, and something peeks out of the lid; a colorful wooglefoof. Prince Viridian wants to keep the wooglefoof to add color to his life, but the royal color catcher has a different plan. Prince Viridian and the wooglefoof spend the rest of the book trying to get away from the royal color catcher. This book is illustrated incredibly. The grayscale is done in such a way that makes the kingdom appear gloomy and sad, which is exactly what the Prince and the King feel when then Queen dies. It is also how the Prince feels about the loss of color. When the wooglefoof appears, it is a bright pop of color against the gray and it really stands out. It is also multiple colors, which adds more excitement. One of my favorite elements of the book was the creative character names. The Prince, King and Queen were all named after colors. This represents the days before the queen died when every color imaginable could be found all over the kingdom. Other royal members of the kingdom, including the Duchess, Archduke and Baroness, all have names that a colorless world would invoke, such as humdrum and blah. Something about this book didn't quite work, but I can't figure out what. It has an interesting premise - when the beloved, color-loving queen dies, the heart-broken king banishes all color from the kingdom. The prince grows up in a grey world, until he receives a bright, rainbow-colored pet for his birthday. The court-appointed color catcher turns out to be evil, happy to do away with the prince along with his colorful pet so that he (the color catcher) can somehow end up in charge of the kingd Something about this book didn't quite work, but I can't figure out what. It has an interesting premise - when the beloved, color-loving queen dies, the heart-broken king banishes all color from the kingdom. The prince grows up in a grey world, until he receives a bright, rainbow-colored pet for his birthday. The court-appointed color catcher turns out to be evil, happy to do away with the prince along with his colorful pet so that he (the color catcher) can somehow end up in charge of the kingdom. The prince and his pet find the court painter imprisoned underground, and eventually the three escape and bring both color and happiness to the king and the entire kingdom. The illustrations are in the same genre as Tim Burton. The story feels choppy - the color catcher goes after the pet, the pet disappears, the king and the prince have a heart-to-heart about why the king banished color, the prince says that he'll change the rules when he is king, the color catcher overhears this and says "then we must make sure you never become king", a spider appears dangling a piece of colorful full in front of the prince's face, the prince takes off after the spider to find the pet, the color catcher chases the prince... it just feels choppy. This book is very well done. It is a graphic novel for kids (so not a novel, but short story), there are words in it, but there are whole pages where parts of the story are actually progressing, and there are no words, so If you don't pay attention to the pictures the story is jumpy. BUT if you pay attention to the pictures it flows well. I think kids would really like the book, but initially you may have to direct their eyes to the correct pictures at the correct time. The story is about a real This book is very well done. It is a graphic novel for kids (so not a novel, but short story), there are words in it, but there are whole pages where parts of the story are actually progressing, and there are no words, so If you don't pay attention to the pictures the story is jumpy. BUT if you pay attention to the pictures it flows well. The story is about a really sad kingdom where everything is gray because the king forbid any color. The prince receives a Very colorful gift for his birthday and it is taken away because of the rules. Then the prince goes in search of his new pet and adventures follow. This had a Tim Burton feel to it, which I appreciate. The entire kingdom was drab, cloaked in gray as it was devoid of all color. The King was sad after his wife died so he had a royal color catcher remove all the colors to avoid any reminders of her since she loved colorful things. Even titles for royalty were plain. “He shuffled past the Duchess of Humdrum, the Archduke of Monotonous, the Baroness of Blah, and other members of the royal court.” Sad empty frames adorned the walls that once show This had a Tim Burton feel to it, which I appreciate. The entire kingdom was drab, cloaked in gray as it was devoid of all color. The King was sad after his wife died so he had a royal color catcher remove all the colors to avoid any reminders of her since she loved colorful things. Even titles for royalty were plain. “He shuffled past the Duchess of Humdrum, the Archduke of Monotonous, the Baroness of Blah, and other members of the royal court.” Sad empty frames adorned the walls that once showcased colorful portraits. The Prince wanted a change. There are fantastic illustrations in grayscale and then a sudden splash of vibrant color appears as a silly creature called a “wooglefoof” gets delivered to the prince for his birthday. It never answered the question “Who sent the anonymous gift?” An exciting rooftop chase followed as the color catcher tried to capture it. There were subtle shadows lurking in the halls of the castle which I did not notice the first read-through. Well done. It demonstrated how sometimes shadows may appear scary when they in fact are not; a young girl was revealed in the dungeon as light was shed on her. This taught a small life lesson that sometimes when we lose a loved one, even though at times it saddens us, it may bring us happiness too when we remember them and the good they brought into our lives and how they made it better. Our prince is a friend who is lonely and sad. I know we all have had times were we have been sad and had to find ways to use our imaginations to not be lonely. He wonders what his world would look like if color came back. His dad, the king, banished color after his mom died. What will happen if he finds color? What do you think he will do? How might he find ways to use color and not be lonely? Opening Moves: Raise interest in topic or theme, raise questions in the readers' minds, and prompt the l Our prince is a friend who is lonely and sad. I know we all have had times were we have been sad and had to find ways to use our imaginations to not be lonely. He wonders what his world would look like if color came back. His dad, the king, banished color after his mom died. What will happen if he finds color? What do you think he will do? How might he find ways to use color and not be lonely? Opening Moves: Raise interest in topic or theme, raise questions in the readers' minds, and prompt the listeners to notice details. As part of this text set, we will look at how the pictures begin in shades of grey then show colors as the prince looks to discover colors. He thinks about what colors might be like as he has a few memories. Through opening their imaginations, the students can predict how colors transform the character, leaving him happy and less lonely. Once he finds colors, can he keep them? They must look for details in the pictures to help them understand what is not written by the author, some pictures are more dramatic than others. 21Sept. 2011 posted online. Kirkus Reviews. This review has been hidden because it contains spoilers. To view it, click here. The kingdom has been colorless since Queen Perylene passed away, and the King continues to mourn his loss by forbidding color anywhere. When Prince Viridian receives a rainbow wooglefoof for his birthday, the royal color catcher immediately removes it to the dungeons. Vowing to restore all the colors to the kingdom, Viridian goes in search of his pet - with the color catcher in hot pursuit. He has his own agenda, and plans to keep his cushy - if dreary - job. Will Viridian succeed in his mission The kingdom has been colorless since Queen Perylene passed away, and the King continues to mourn his loss by forbidding color anywhere. When Prince Viridian receives a rainbow wooglefoof for his birthday, the royal color catcher immediately removes it to the dungeons. Vowing to restore all the colors to the kingdom, Viridian goes in search of his pet - with the color catcher in hot pursuit. He has his own agenda, and plans to keep his cushy - if dreary - job. Will Viridian succeed in his mission? Apparently he will. And he and the wooglefoof will save the kingdom. And his father will forget his sadness and remarry, like right away (who is that woman standing next to him on the balcony at the end of the book?). And everyone lives happily ever after. Except, presumably, the color catcher, who got blasted into the atmosphere when he inadvertently set off the fireworks hidden in the dungeons' depths. Anderson, B. (2011). The Prince’s New Pet. New York: Roaring Book Press. This picture book is about a prince who has secretly received a new colorful pet on his birthday. However, his father has not allowed anything colorful into the kingdom since his wife passed away and takes the pet from his son. The prince ends up going on an adventure to find the pet, but comes back with even more. The illustrations are mostly dark, with the occasion Anderson, B. (2011). The Prince’s New Pet. New York: Roaring Book Press. This picture book is about a prince who has secretly received a new colorful pet on his birthday. However, his father has not allowed anything colorful into the kingdom since his wife passed away and takes the pet from his son. The prince ends up going on an adventure to find the pet, but comes back with even more. The illustrations are mostly dark, with the occasional bright pop of color. There is also a lot of writing in this story and some of the words are pretty complex for a picture book for little children. This book can be used to teach students about sequencing and using transition words when writing. It can also be used for “what happens next” writing assignments as well. This would be a great book for 3rd-6th graders and students that are advanced readers. I really enjoyed the storyline and how the illustrations looked. I am a huge Tim Burton fan and the illustrations remind me of images you would see in a Tim Burton movie. I love this book! King Cerulean bans color from his kingdom after the queen dies on the Prince's 2nd birthday. The queen loved color, so every time the King saw any color at all, it reminded him of her. The poor Prince is so tired of gray! He receives an extraordinarily colorful pet for his birthday which is immediately taken away from him by the villianous Color Catcher. When the Prince searches for his pet in a dungeon, the Color Catcher tries to capture the Prince! You'll have to read it to find out how color King Cerulean bans color from his kingdom after the queen dies on the Prince's 2nd birthday. The queen loved color, so every time the King saw any color at all, it reminded him of her. The poor Prince is so tired of gray! He receives an extraordinarily colorful pet for his birthday which is immediately taken away from him by the villianous Color Catcher. When the Prince searches for his pet in a dungeon, the Color Catcher tries to capture the Prince! You'll have to read it to find out how color is restored to the land. This book was really enjoyable! Its about a kingdom turned colorless by a grieving king and his evil color-catching right hand and a prince who wants to bring the color back. The prince is kind of a hero, but the circumstances are really what turn the situation around in this story. I would phrase it like Jurassic Park: Color always finds a way! He gains a couple sidekicks as the story progresses. There is definitely a villain: the color catcher. And the grieving king is just sad and reminds me This book was really enjoyable! Its about a kingdom turned colorless by a grieving king and his evil color-catching right hand and a prince who wants to bring the color back. The prince is kind of a hero, but the circumstances are really what turn the situation around in this story. I would phrase it like Jurassic Park: Color always finds a way! He gains a couple sidekicks as the story progresses. There is definitely a villain: the color catcher. And the grieving king is just sad and reminds me of the awful dad in Tom the Tamer. Man up, dads! Creator of the syndicated comic, "Dog eat Doug". Upcoming books include "Monster Chefs" and "The Conjurers" series from Crown Books. Lifelong Whovian, magician and puppet enthusiast. Dreams of being stranded on a space station with Ernest Hemingway, Neil Gaiman, Clive Barker and Guillermo Del Toro.